San Francisco is "a mad city," wrote Rudyard Kipling of his visit in 1889, "inhabited for the most part by perfectly insane people." Indeed, San Francisco's reputation as brash, exotic, offbeat, diverse, free-spirited, opinionated, self-confident, quirky, and above all, fun was well established by the end of the nineteenth century. By the 1870s, it was already known as the Paris of the West-a must-visit destination for tourists, mariners, sightseers, and fortune seekers, a city of mystery and intrigue, a gathering place for the world's adventurers. San Francisco "is not only the most interesting city in the Union and the hugest smelting-pot of races," wrote Robert Louis Stevenson, but "she keeps, besides, the doors of the Pacific, and is the port of entry to another world and an earlier epoch in man's history." The city had grown up haphazardly-with little or no urban planning-as the locus of the gold rush, and it boasted a fiercely independent population of adventurers hailing from Europe, Asia, and the eastern United States. These immigrants, of course, brought with them not only their material possessions but also their musical cultures, fostering a fascinating, if at times unrefined, sonic diversity. 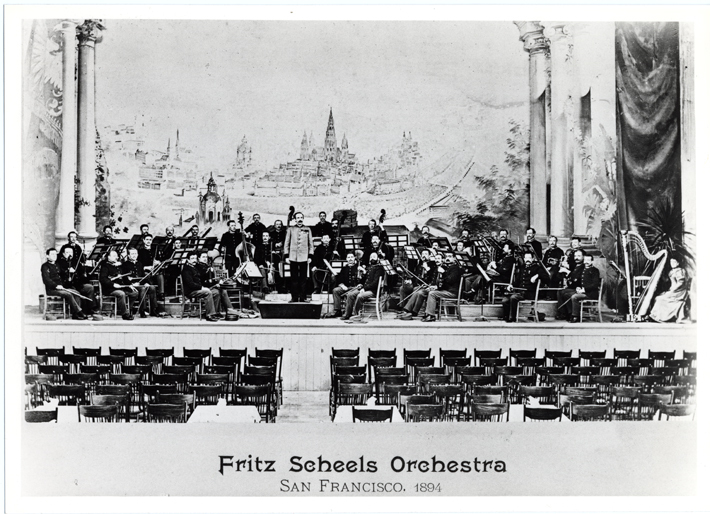 Among the early settlers who particularly prized music as a historical marker were the Germans, who came to San Francisco in large numbers and proudly built on their long-established tradition of instrumental music. From the 1850s through the early years of the twentieth century, a series of conductors-mostly German (or German-trained)-attempted to establish high-quality professional orchestras. Rudolph Herold, Louis Homeier, Gustav Hinrichs, Fritz Scheel, Paul Steindorff, Frederick Wolle, William Zech: all founded symphonic groups that flourished for short periods. All ultimately failed. When the San Francisco Symphony finally opened its first season in 1911, a U.S.-born conductor, Henry Hadley, was at the helm. Four years later, however, he was replaced by another German, Alfred Hertz, who built the orchestra into an outstanding ensemble and who remained in charge until the Depression. A large Italian contingent set up its own subcommunity in the North Beach area of the city and promoted opera so successfully that San Francisco became a magnet for traveling companies from the East, as well as from South America. 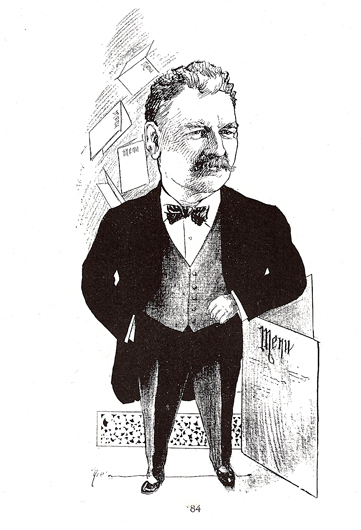 The city's first complete opera presentation took place in February 1851, only three years after James Marshall discovered gold at John Sutter's mill. The eventual establishment of a resident company, however, was hampered in the early twentieth century not only by the dearth of experienced singers, managers, and directors but also by the absence of a suitable venue. After April 1906, when all the major theaters were destroyed in the devastating earthquake and fire, political squabbling blocked the construction of an opera house for another twenty-six years. Nevertheless, an enterprising Italian, Gaetano Merola, managed to found the San Francisco Opera in the early 1920s; it performed in venues with frustratingly poor acoustics for a decade. 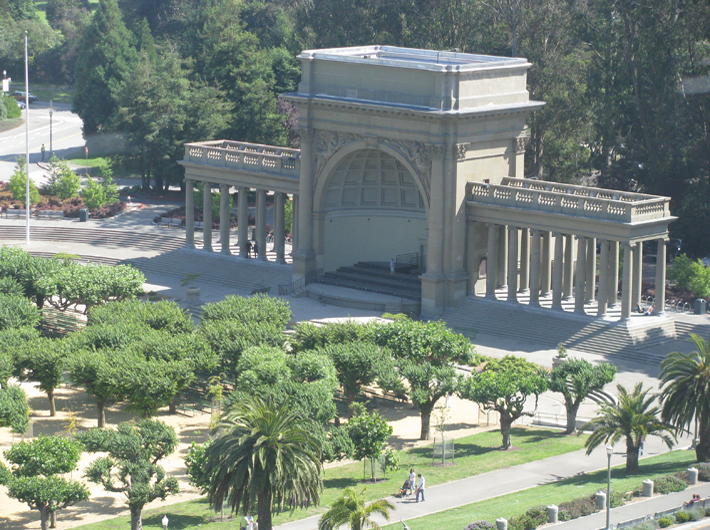 Rival statues in Golden Gate Park mark the German and Italian musical territories. 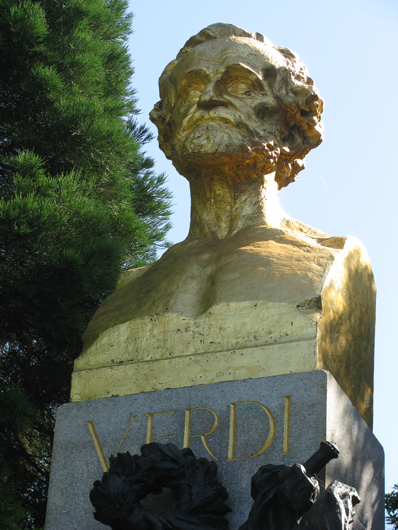 In 1914 the Italians erected a vibrant bronze tribute to Verdi at the climax of a grandiose operatic festival; it was unveiled in a ceremony that reportedly attracted twenty thousand people. Adult and children's choirs sang, but the biggest attraction was San Francisco's prized musical discovery-prima donna Luisa Tetrazzini, who had made her U.S. debut in the city in 1905. The following year the Germans weighed in with a sober tribute to Beethoven (a replica of the statue in New York's Central Park), whose dedication inaugurated a three-day Beethoven Festival. A thousand people attended the statue's unveiling and "bared their heads" as they listened to the band play the second movement of the Fifth Symphony. 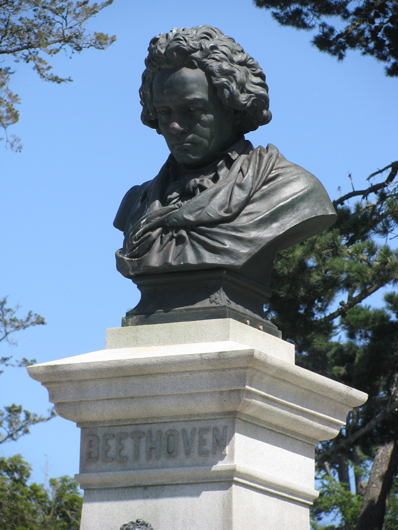 The dark-colored Beethoven, head bowed in deep contemplation, stands next to the park's Temple of Music, an elegant stone shell and stage erected in 1900 with a donation from sugar king Claus Spreckels. In stark contrast, the gold-colored Verdi holds his head high, looking down on Beethoven and the music concourse from a hill behind the stage. Jewish entrepreneurs also arrived during San Francisco's gold rush years and discovered a welcoming community in which to establish businesses that served the mining pioneers. By 1850 two synagogues (still functioning today) served the growing population: Temple Emanu-El, catering to the wealthy German Jews, and Sherith Israel, serving the eastern European immigrants. Among the early arrivals was Levi Strauss, who came to the city in March 1853. Two of his nephews, Jacob and Sigmund Stern-heirs to Strauss's blue-jeans fortune-became particularly strong supporters of the arts, both visual and aural, as did numerous other members of the Jewish community. Among the founders of the San Francisco Symphony, Jewish names appear in far greater numbers than their proportion in the population: Ehrman, Esberg, Fleischhacker, Gerstle, Haas, Hecht, Hellman, Jacobi, Koshland, Lilienthal, Schloss, Sloss, Stern, to name but a few. 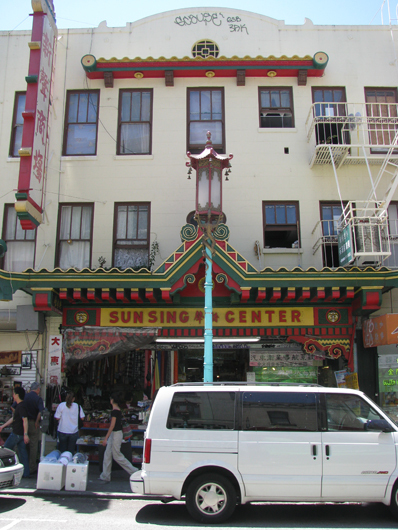 In later years, many of these patrons continued to serve San Francisco's cultural community. Sidney Ehrman was one of the principal supporters of local violin wunderkind Yehudi Menuhin (whose father was a San Francisco Hebrew-school teacher); the Fleischhackers founded the San Francisco Zoo; Cora Koshland delighted in hosting elaborate musicales at her Presidio Heights mansion-modeled on the Petit Trianon at Versailles and complete with pipe organ-in which she could seat an audience of a hundred or host informal gatherings three times that size; and Rosalie Stern, in the 1930s, donated to the city a thirty-three-and-a-half-acre grove near Golden Gate Park. The Sigmund Stern Grove, named in memory of her husband, continues to host operatic and orchestral outdoor music events that attract thousands of attendees. 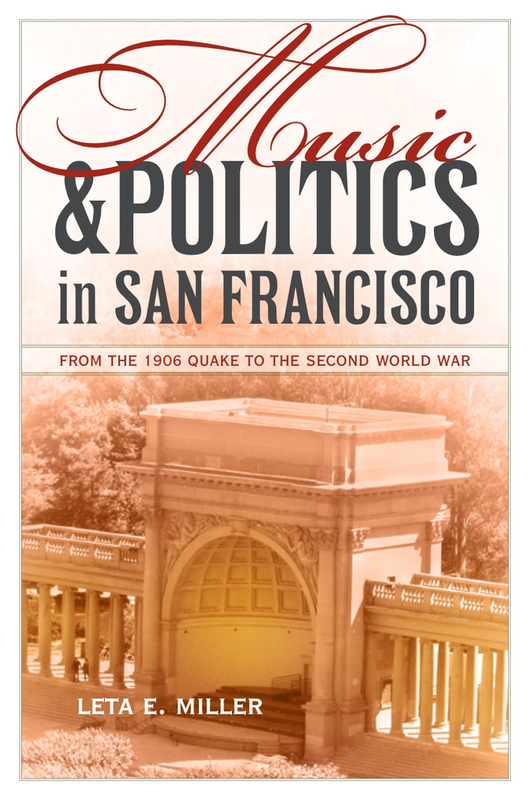 This lively history immerses the reader in San Francisco’s musical life during the first half of the twentieth century, showing how a fractious community overcame virulent partisanship to establish cultural monuments such as the San Francisco Symphony (1911) and Opera (1923). 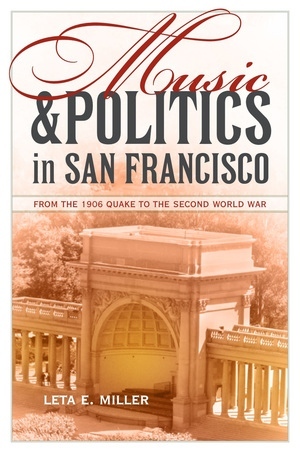 Leta E. Miller draws on primary source material and first-hand knowledge of the music to argue that a utopian vision counterbalanced partisan interests and inspired cultural endeavors, including the San Francisco Conservatory, two world fairs, and America’s first municipally owned opera house. 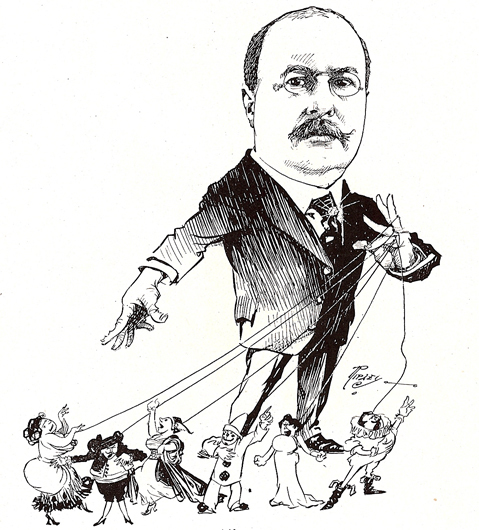 Miller demonstrates that rampant racism, initially directed against Chinese laborers (and their music), reappeared during the 1930s in the guise of labor unrest as WPA music activities exploded in vicious battles between administrators and artists, and African American and white jazz musicians competed for jobs in nightclubs. Leta E. Miller is Professor of Music at the University of California, Santa Cruz and is coauthor (with Fredric Lieberman) of Composing a World: Lou Harrison, Musical Wayfarer and Lou Harrison. "Leta Miller’s San Francisco’s Musical Life is a pure pleasure to read. Miller manages that rare feat of digesting what must have been many years of digging through newspapers and archives into a fun, lively, highly readable narrative. Each chapter strikes a comfortable balance among factual exposition, colorful anecdote, and historical analysis. Miller brings equal depth and insight to each of her disparate subjects, she writes with charm and clarity throughout, and the whole is arranged in a way that is clear and logical, never monotonous." Image 6. 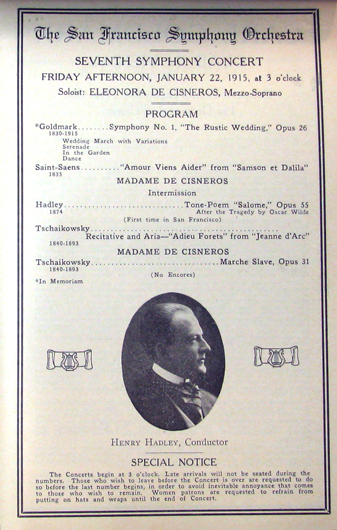 San Francisco Symphony concert program, Jan 22, 1915, showing the typical image of Henry Hadley that appeared on programs during his years as conductor. (Courtesy of the San Francisco Symphony). Book reference: p. 43. Image 7. 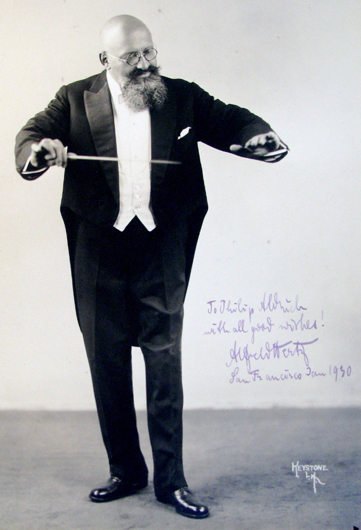 Photo of the San Francisco Symphony’s second conductor, Alfred Hertz, 1930. (Courtesy of the Jean Hargrove Music Library, University of California, Berkeley.) Book reference: p. 57. Image 9. Concert at the San Francisco Civic Auditorium, Feb 23, 1928, showing 11,000 fans packing the hall to hear Yehudi Menuhin play the Beethoven violin concerto with the San Francisco Symphony. Menuhin, age 11, is shown in front of the orchestra, shaking hands with conductor Alfred Hertz. (Courtesy of the Jean Hargrove Music Library, University of California, Berkeley.) Book reference: p. 124. Image 10. 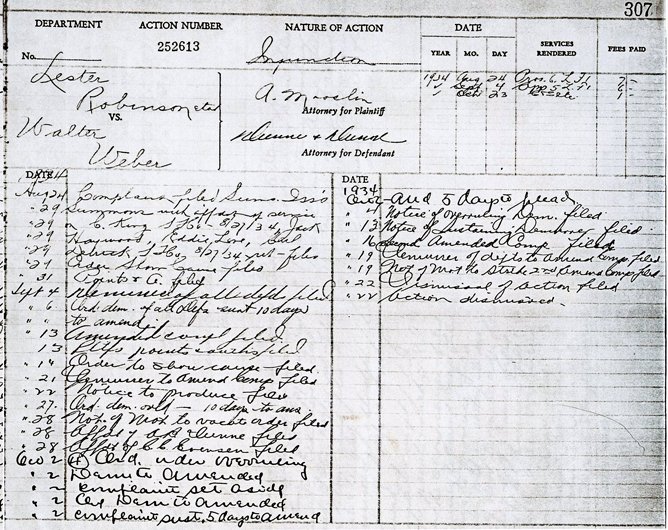 San Francisco Superior Court, Record of Action, case no. 252613, 1934, showing an injunction filed by Lester Robinson et al. (members of the American Federation of Musicians’ “Colored Local” No. 648) against Walter Weber (president of the much larger AMF Local 6). Book reference: p. 174. Image 12. 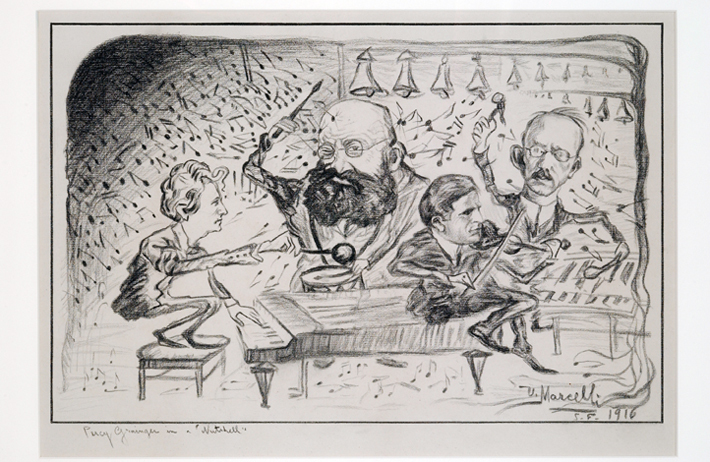 Caricature by violinist/violist Ulderico Marcelli, showing (left to right) Percy Grainger, Alfred Hertz, Louis Persinger, and Redfern Mason on the occasion of Grainger’s performance with the San Francisco Symphony in December 1916. The cartoon appeared in the San Francisco Examiner on Dec. 24, 1916. (Reproduced courtesy of the Grainger Museum, University of Melbourne.) Book reference: p. 207–8.